Most rambling experts advise you to ramble with others rather than go alone, but what do you do if none of your friends are interested in rambling? This is where rambling groups and clubs are worth their weight in gold. 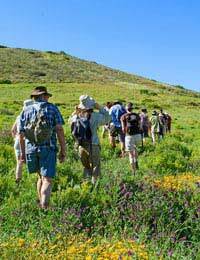 They give you the opportunity to ramble with like-minded souls and make some great new friends. Meeting fellow rambling fans isn't the only reason to join a rambling group. Most rambling groups will organise rambles for their members, which takes the stress out of planning your own rambling route (see our article on 'Planning A Route' for more information on that). How Do I Find My Local Rambling Group? Most rambling groups are affiliated with the Ramblers Association. Most rambling groups cater for a specific geographical area. They are usually open to ramblers of all abilities, but some of their organised walks may be aimed at specific abilities (for example, hill walks). There are also groups that are designed for specific age groups, notably those in their twenties and thirties. There are around fifty of those across the UK, and they offer a great chance to connect with fellow ramblers in your age group. Other groups specialise in catering for those with families (see our article on 'Family Rambling'), or those who are only interested in short and easy walks. Finding your local rambling group isn't particularly difficult. Many now have websites to promote themselves, so this might be a good place to start. Type "Cheshire rambling groups" (substitute Cheshire for your local area obviously!) or similar into your search engine and see if anything relevant comes up. If it does, the website should provide more information about the group, and how to join it. Alternatively, you can visit the Ramblers Association website, which offers details of their led walks. If your local rambling group doesn’t have a web presence, you'll have to try a more old-fashioned approach to tracking them down. Your local Tourist Information Office will probably have details of nearby walks. If you're not sure whether you definitely want to join a rambling group, a national walking festival might be the best option for you. The Ramblers Association website can provide details on these. National walking festivals provide the opportunity to do a few rambles on a trial basis, without needing prior commitment. Some rambling groups allow non-members to join in on selected rambles, also on a trial basis. However, most rambling groups require you to be a member to take part in their organised walks, but some will allow you to "sample" their services for two or three rambles before you're pressed to join. There are an estimated 500 rambling groups in the UK, so finding one near you shouldn't be too much of a problem! Joining is relatively simple, and has some definite benefits. They put on rambling events throughout the year, so don't worry if you can't make every walk. Most rambling groups do require you to part with some cash to make a fully-fledged member, but it's usually more than worth the expense.